You can use the developer console to create a new skill. A name that identifies the skill. When you publish the skill, this becomes the public name that customers will see in the skill store. You can edit this name before you publish if necessary. The initial language to use. You can add support for additional languages later. The interaction model that defines how users interact with your skill. After you create a skill, the specific configuration options you need to provide depend on the specific model that you choose. The requests the skill can handle (for example, plan a trip, get a fact, turn on a light, find and play video content). "Alexa, tell plan my trip I want to go to Seattle"
"Alexa, ask cat facts for a fact"
"Alexa, play Manchester by the Sea"
For the custom model, you define the requests (intents) and the words (sample utterances) yourself. Your code then determines how your skill handles each intent. For the pre-built models, the possible requests and utterances are pre-defined for you. Your code determines how your skill responds to those requests. The following table summarizes the models you can select in the developer console. Create a custom voice user interface for the skill. This gives you complete control over the experience. You build an interaction model to define the requests the skill can handle (intents) and the words the users say to make these requests (sample utterances). For details about skills with a custom model, see Understanding Custom Skills. Create a skill that provides content for the user's flash briefing feed. You provide an RSS or JSON feed with the content. Users invoke the skill by asking for their flash briefing. For details about skills with the flash briefing model, see Understand the Flash Briefing Skill API. Create a skill that controls smart home devices such as cameras, lights, locks, thermostats, and smart TVs. The model defines the supported requests (such as turning on a light) and the words users say to invoke those requests ("Alexa, turn on the living room lights"). Your code determines how your skill responds to those requests. 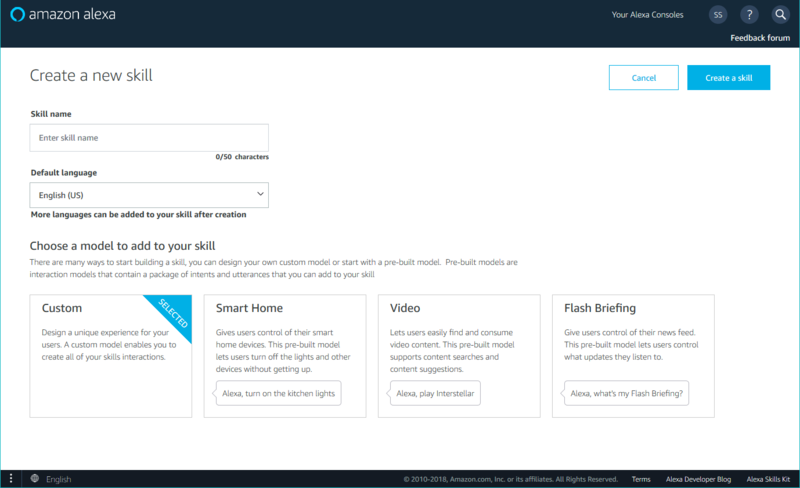 For details about skills with the smart home model, see Understand the Smart Home Skill API. Create a skill that lets users find and consume video content. The model defines the supported requests (such as finding a particular program to watch) and the words the users say to invoke those requests ("Alexa, play Manchester by the Sea"). Your code determines how the skill responds to those requests. For details about skills with the video model, see Understand the Video Skill API. Be sure to start the skill from the developer console. Click the model you want to include. Available models include: Custom, Smart Home, Video, and Flash Briefing. For a custom skill, either select a quick start template or select Start from scratch to create a new blank skill, then click Choose. Once the developer console has created your new skill, you can start to configure it on the Build page. The specific information you need to provide depends on the model you select.